CMAT 2019: CMAT is the next popular exam after CAT. It Stands for Common Management Admission Test. It is a national level exam from 2019 it will be conducted by National Testing Agency instead of All India Council of Technical Education (AICTE). Latest Update: CMAT Result is expected to be released before the schedule. So Keep Visiting for more Info. Latest Update: Students can also Challenge the Answer Key, Visit the Official Website and Follow the Onscreen Procedure. Latest Update: Appeared Candidates can now check CMAT 2019 Question Papers and Their Response. Just Visit the Official Page and Login there. Latest Update: CMAT 2019 Admit Card released on 7th January, Check the procedure to Get it Below. Latest Update: CMAT 2019 Registration Starts from today (1 Nov.) Check Process and Dates Below. Latest Update: CMAT 2019 Schedule Announced Check Below. Check Dates Below. CMAT 2019 Dates have been already announced way before the exam, and according to it, the exam will be conducted on 28th January 2019. To reduce the strain from your mind we are publishing this article which has everything you need to know about CMAT Exam. Some of the Dates are already known and some events are having date period. 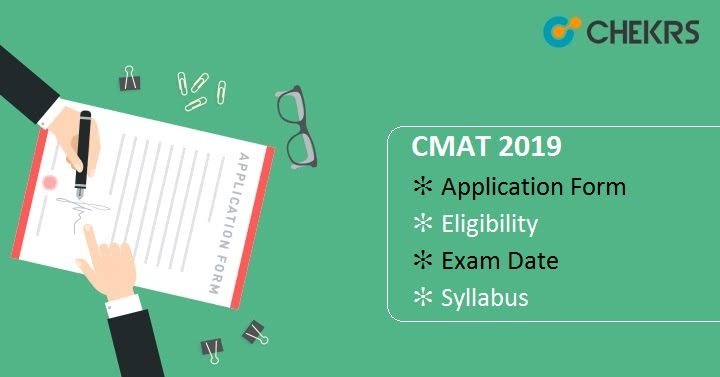 Candidates seeking admission through CMAT 2019 will find this table containing CMAT 2019 Dates helpful. There are very few criteria for CMAT Entrance exam but we have to wait for the final official notification, till then here is the CMAT Eligibility Criteria. All the Indian Citizens having a graduate degree in any discipline are eligible for CMAT 2019. There is no age restriction for the exam. Candidates appearing in final years of graduate courses (10+2+3) are also eligible for the exam. Graduated Candidates who done their graduation as part-time or distance mode are also eligible. CMAT 2019 Registration will start from 1st November 2018. The last date to submit CMAT Application Form is 30th November 2018. Candidates have to submit their correctly filled Application form before the last date. In the Application, form candidates need to select upto 3 examination cities as the test cities in their application form. Candidates need to follow these summarized steps to fill the application form. Visit the Official website, and register yourself. Now login using the login details. Fill all the asked details in the application form. Upload all the required images. Take print-out of filled application form and payment receipt. CMAT Application Fee can be paid through Online mode via Credit/ Debit card, Net Banking, and Cash payment at SBI Bank. The Application Fee will be Rs 1400/- for General and OBC candidates and rs. 700/- for female/ SC/ ST/ Pwd candidates. There will be some extra bank Charges will be included in it. We are providing CMAT Exam Pattern Here to help you in your preparations. The exam will be conducted through online mode and paper will have 100 MCQs. Other details are given below. -1 marks for every wrong answer. There is no prescribed Syllabus for the CMAT Entrance Exam. CMAT 2019 New Syllabus will contain questions Quantitative Techniques & Data Interpretation, Logical Reasoning, Language Comprehension, and General Awareness. Other details are given below. The Admit card will be available through Online Mode on the official website. It will be accessible from the 1st week of January 2019. Candidates need to download the CMAT 2019 Hall Ticket to appear in the examination. Candidates have to bring the Admit card with a Photo ID to the examination center. The result is expected to be released in the first week of February. The result will be uploaded on the Official website. Candidates need to download the CMAT Result pdf and search for their Roll Number to know the result. CMAT 2019 result will be released in two formats All India Merit List & State Merit List. Candidates have to check both of them. The Authority will release CMAT Score Card 2019 for all the qualified candidates. Candidates who have name in the Merit list can download their Score Card from the website. The Score Card will be valid for One Year. The CMAT Scorecard will be considered for providing admission by all AICTE-Approved Institutions/ University Departments/ Constituent Colleges/ Affiliated Colleges.